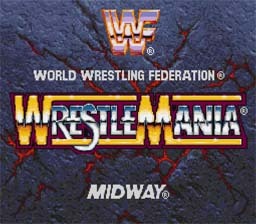 Play WWF Wrestlemania: The Arcade Game Now! WRESTLEMANIA, the biggest night in wrestling. In this Action/fighting game, play as one of six legends: Bret "the Hitman" Hart, Doink the Clown, The Undertaker, Lex Luger, "The Heart Break Kid" Shawn Michaels, and Razor Ramon. The sound quality is good and the gameplay is fast paced, but you cannot perform finishers. This is a very addicting wrestling game, a must play for wrestling fans. You are in the Main Event. Choose between two titles to compete for, they are the Intercontinental Championship and the WWF World Heavyweight Championship. The IC championship is easier to achieve, because you don't have to fight as many wrestlers to win. In the challenge for the WWF HW title, you fight two wrestlers at once to start with. Then at the end you take on the other Five wrestlers at once. To run at the ropes press X + B. You can also attack while you are running. To perform a running grapple, press A while running. To perform a running dropkick, press X while running. To perform a quick grapple press -> -> A. To use your weapon press Y.